Celebrating 50+ years of year-round mountain lodging! The White Pass Village Inn is built to accommodate mountain enthusiasts at the 4,500ft summit of White Pass, WA. All fifty-five condominiums are efficiently designed for individuals, couples & small families to enjoy before-and-after a great day outdoors. We extend a warm welcome to you and your family. Each of our privately-owned units has its own unique floor-plan & personality. Amenities include a kitchenette, television, bathroom, and small deck or balcony. WIFI is not available and pets are not allowed. Common area amenities include access to the outdoor heated pool (open and heated to 100 at management discretion June & Oct-Dec, heated to 85 July-Sept), propane BBQ (Dad's Favorite), and lawn games/snow play area. Unlike the ski area we are open year round! 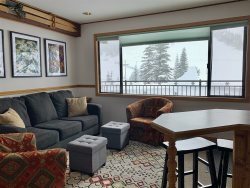 If you have an event in the area and need centrally located lodging near Mount Rainier, want to plan a "staycation" retreat or reunion, or are looking for a place along the highway (or PCT) for a nice stop over, check out our unique lodging. We've got a variety of rooms to fit your seasonal vacation needs, centrally located to great PNW adventure opportunities. Beat the heat in the summer, or the mountain traffic in the winter by staying at the Summit of White Pass! We sincerely appreciate you staying with us and encourage you to embrace the adventure story as we match 21st century lifestyles with relaxed mountain history. The Village Inn hosts rental guests and owners 365 days a year. Office and Phone hours may vary seasonally. We thank you for choosing the Village Inn for your vacation destination! "The walls may be thin and the units minimal, but the atmosphere is one of mountain hospitality and excitement." We are not directly affiliated with the Ski/Nordic area, who provides lift tickets, dining services and a gas/convenience store to the public. Our 5 three-story, classic wooden buildings were built in 1965 as the mountain lodging portion of a US Forest Service special use permit, in cooperation with the White Pass Ski Resort.